The V-R563P is a rack mounted unit that has three independently controlled 5.6″ active matrix LCD panels with active loop-through. These 5.6″ panels have 960 x 234 pixels which produce a true high resolution image. This unit also has a unique feature that allows the unit to tilt up or down for optimum viewing angle. The unit fits into an EIA standard 19″ rack — 3U high. 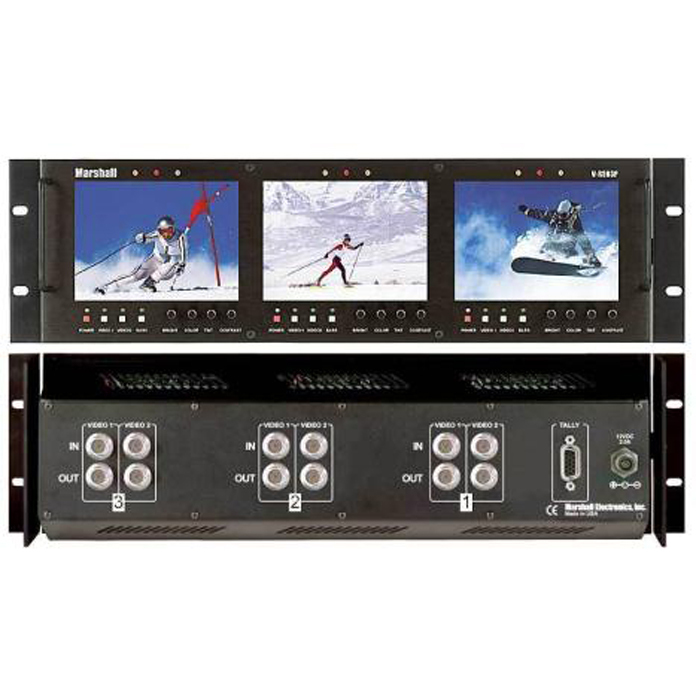 Each screen has two composite video inputs and outputs, along wtih a 3-color tally system. Each of the three screens has a built-in color bar generator, individual front mounted selector buttons with LED indicators and color, tint, brightness and contrast controls. The unit includes power supply / manual and features auto recognition for NTSC or PAL.